Octotroopers are the main Octarian fighters found in Octo Valley and Octo Canyon in Splatoon and Splatoon 2. Octotroopers are Octarians riding on small, simple vehicles consisting of a cylindrical platform with a black ring on the bottom, a long hose-like protrusion with a megaphone-like nozzle on the end, and a single joystick on top that the Octarian uses to operate the vehicle. How the 'base' of the vehicle looks varies from game to game; in Splatoon, it is made of a dark, stainless metal, while in Splatoon 2, it seems to be made from an upside-down blue recycling bin. The second variant introduced in Splatoon 2 has a more unique base design instead - a container-like contraption with a red ends, glass sides that reveal several pre-made balls of ink, and more curved sides instead of straight ones - resembling a gumball machine. Octotroopers serve as the most basic foes featured in both Octo Valley and Octo Canyon, having little health, mobility, basic tactics, and a single attack - periodically firing a slow-moving globe of ink towards Agent 3 or 4 that has limited range but ignores gravity. Under normal circumstances, their simplistic combat skills alongside their placement makes them easy targets in any area, as their attacks are easy to dodge and their low health makes them easy to splat upon getting close enough (only two shots from most automatic weapons, such as the Hero Shot or Hero Dualies, will splat them). The only time Octotroopers are a real threat is when they are encountered in large numbers - some packs of them can reach up to a dozen in a single area - in which it is easy for Agent 3 or 4 to be overwhelmed. Additionally, Octotroopers' projectiles do a deceptively large amount of damage on hit, compensating for how easy they are to dodge. Most Octotroopers are capable of moving - patrolling set areas when alone, strafing around a target when one has been found to shoot at, and running away from bombs - while others are delegated to being stuck on tall, thin poles above the ground, making them function more like sentries than mobile enemies. Splatoon 2 introduces a second variety of Octotrooper that rides a differently-designed vehicle than their normal counterpart. These are identical to the normal variant with the sole exception that they fire a two-shot burst of bouncing ink projectiles along the ground instead of a single, slow globe through the air. This makes them more dangerous than the normal version on open stretches of ground, but harmless if there is a gap between them and their target. If one is unable to splat an Octotrooper, one can take advantage of their slow firing speed and even slower projectiles to simply dodge their attacks. Octotroopers will immediately stop whatever they are doing and flee from a bomb if one is thrown at them. Thus, consider using bombs on Octotroopers that are against a wall or in a corner to prevent them from fleeing the blast radius in time. While Octotroopers will advance towards and invalidate Agent 3 or 4's cover if they are in any (assuming they do not lose track of them), they will never attempt to seek cover themselves, making rushing them an effective tactic. The projectiles Octotroopers fire are slow but hard-hitting. Do not underestimate a large group of them. If an Octotrooper moves over a patch of the Agent 3 or 4's ink, their vehicle will sink in it and get stuck, causing the Octotrooper to fight with the vehicle's controls while still shooting and suffer from a reduced turning speed. If they choose to retreat, however, the Octotrooper will point the nozzle on their vehicle straight down and spray ink beneath them, freeing them from being stuck. In certain levels, Octotroopers will emerge from broken crates in an attempt to ambush Agent 3 and 4. Be wary of unmarked crates if there are no other enemies around. When fleeing from something, such as an Industrial Squee-G, Octotroopers will make no effort to avoid falling off ledges or cliffs, even if it means falling off the entire level and instantly splatting themselves. Octotroopers appear in the majority of Octo Valley missions, with some notable exceptions: the four main Boss stages, the four Octoling levels, and Unavoidable Flying Object. Levels which do contain Octotroopers can have as few as two or more than twenty throughout. In the end of the fan-made issue of Splatoon, a then unnamed Glasses-Kun flies over a bunch of Octotroopers and Octoballs. They also appear in the Hero Mode issues of the manga. 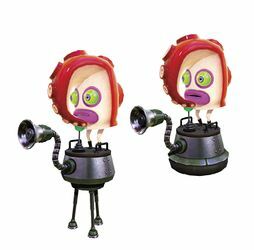 Octotroopers share their vocalization sounds with Twintacle Octotroopers, Octoballs and Octocopters. Artwork of an Octotrooper in Splatoon 2. A screenshot of the other Octotrooper variant. The other Sanitized Octotrooper variant. An Octotrooper in Octo Valley Mission 1: Octotrooper Hideout. A group of Octotroopers in Octotrooper Hideout. Cap'n Cuttlefish beside an Octotrooper. Concept art of the Octotrooper's hovercraft, from The Art of Splatoon. Octotroopers in Turquoise October's album art. Official art of a startled Octotrooper. An Octotrooper with long, bare legs. An Octotrooper with a UFO. An Octotrooper on a Flooder. Promo art of Marie and an Octotrooper for the Squid vs. Octopus Splatfest. A group of Octotroopers in the Splatoon manga. Octotrooper and Octoling as they appear in Octo Canyon. An Octotrooper mem cake (lower left) in a promo for Splatoon 2's Octo Expansion. A picture of Octotroopers in a fight between Cap'n Cuttlefish and DJ Octavio shared in Marina's chat room. Twintacle Octotrooper, a stronger variant of the normal Octotrooper. Shielded Octotrooper, a more durable variant of the normal Octotrooper.